Recipes do not come much simpler than this, which is perfect for this busy time of year. You just throw everything in to your cooker and leave it to cook. This is the ideal meal to cook if you are having people over, as everyone just helps themselves, which leaves you to sit back and enjoy yourself. The added bonus is it is low in calories and low in fat too. If you want to be kept up to date on more delicious and healthy recipes like this, then please subscribe to the blog mailing list (it takes 30 seconds) and you will get sent the new recipes straight to your inbox. Your email address won’t be passed on to anyone and you will never be spammed. Click here to sign up. If we are having friends over for dinner and I don’t have a lot of time to spend in the kitchen before they arrive, this is my go to meal. 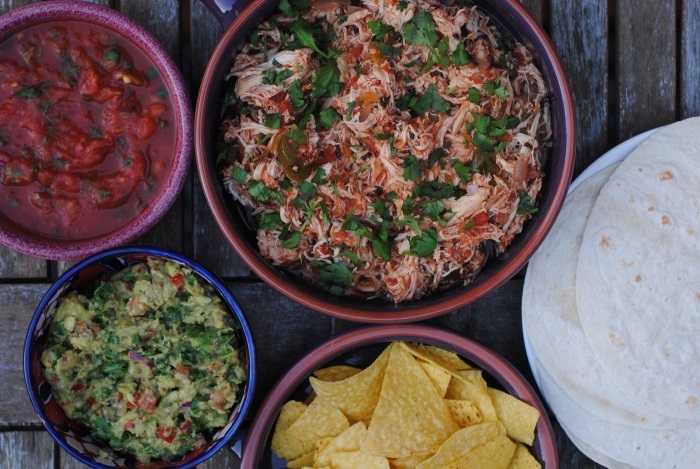 Just a few little extra things, like guacamole, before they arrive and you have yourself a Mexican feast. This meal is low in calories, low in fat and high in flavour. You can adapt it to make it as spicy or as mild as you want too. If you are having people over, I would say make it on the mild side and then just put some extra spicy salsa and hot sauce out one the table for people to add extra heat if they want to. Oh, do I have some amazing new Mexican recipes to share with you all in the new year! 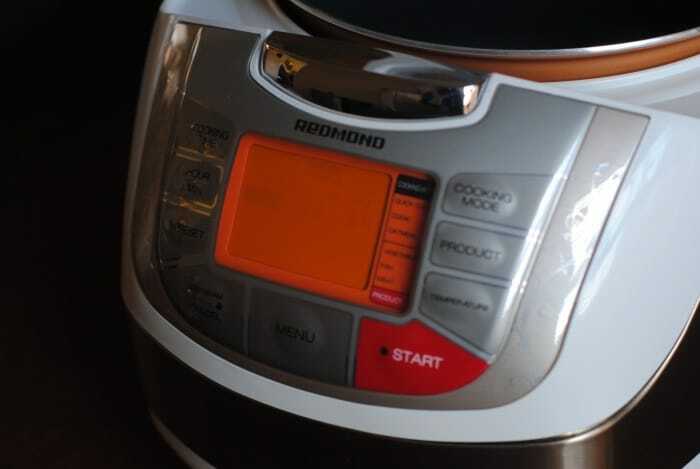 I have a new gadget in my kitchen – the REDMOND Multicooker. 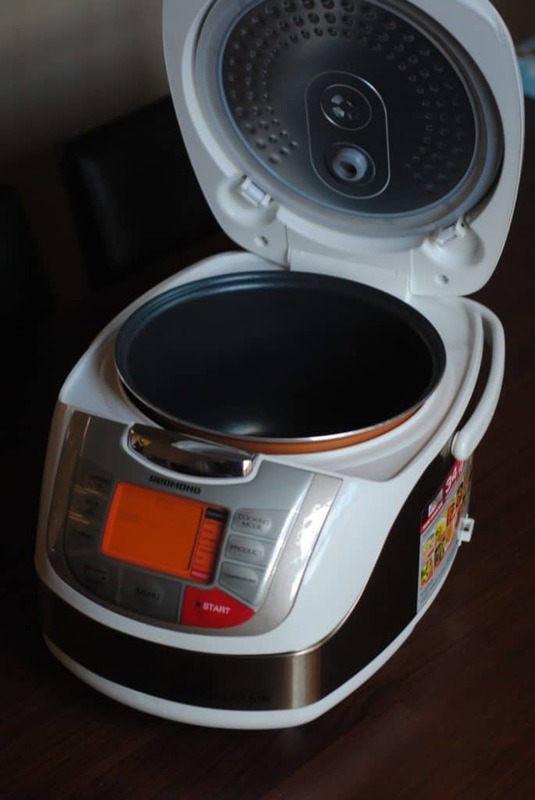 It doesn’t exaggerate when it says it is a multicooker, as it really does do everything: soups, stews, oats, cakes, steams, yoghurt, pasta, fondue, bread. You might be thinking, do you really need another gadget in your kitchen? But this REDMOND Multicooker will save you having to have everything else, as it combines them all. Although I think everyone could make use of this, I think it would especially appeal to people that are short on kitchen space, like students. I know I wish I had this when I was living in student halls many years ago. It’s not just for people with small kitchens though, much like a slow cooker it is a massive time saver. You just put everything in and it does it all for you, which is why I am sharing this recipe now. In the run up to Christmas, as I find myself in a frenzy of Christmas lights, food shopping and trying not to get tangled up in celotape when wrapping presents, this has come in so handy. One of the things I really like about it is how surprisingly small it is. When I read about everything it did, I thought it would be huge, but it isn’t at all. It also makes hardly any noise, unlike some cookers I have had in the past. It is also fairly light as well, making it easy to move if you need to. My slow cooker is sometimes a 2 person job to get it back in the cupboard, so this is an improvement on that. Oh, and it’s easy to clean! You may have seen from previous reviews I have done of other products, that is important to me. It has 34 preset programs and also a booklet of 100 recipes to get you started. The recipe book is very precise, in that if you start changing the amount of ingredients in the recipes, it won’t cook the same. So either follow the recipes, or go the trial and error route, which is what I did. Luckily this salsa chicken turned out perfectly first time. Really moist and full of flavour. There is also a REDMOND App with lots more recipes. Don’t be put off by the settings. It might look a little intimidating at first, but it’s actually really easy to use. That is coming from me, a technophobe at the best of times. This recipe can also be made in a slow cooker (cooked on low for 4 hours) but I can’t recommend the REDMOND Multicooker enough. Such a versatile kitchen gadget. What is your go-to meal when you are short on time? Leave a comment below. 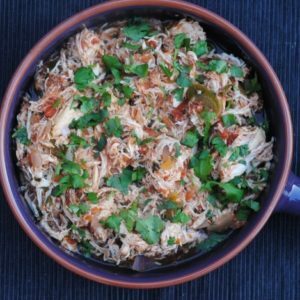 Salsa chicken is actually on my list to make as soon as Summer is over- I can’t overcook my house by turning on the slow cooker haha! 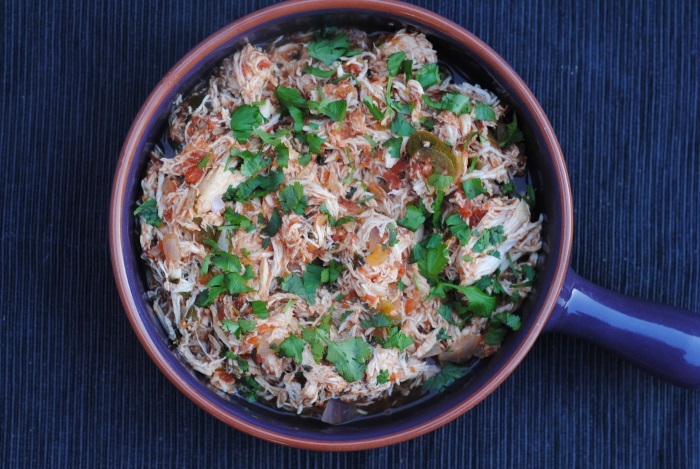 This recipe is so delicious and simple and the multi cooker is genius! Can’t wait to try lots of other things to cook in it. I have some bread planned for today! Mine too. I like it still with a bit of a bite. That guacamole looks perfect. What do you put in yours? I need to get myself one of those multicooker things. I am a useless cook and that looks like it would make things easier. Thanks for the review. I am sure you are better than you think you are. But it does make things a lot easier. All that mexican food looks really good. I could honestly eat mexican food every day. Oh, me too! I would never get bored. I love easy recipes that you can throw together especially during this time of year! 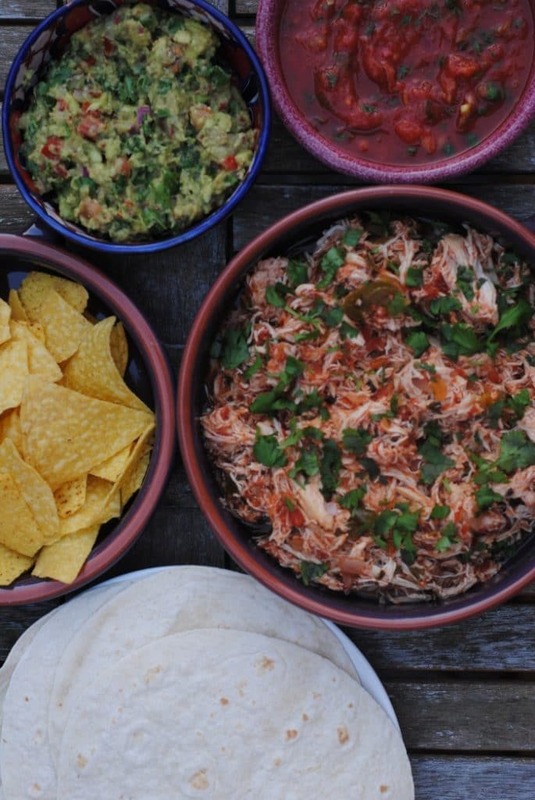 This salsa chicken looks fabulous and that multicooker sounds like such a cool gadget! This is really simple. Love that it only has two ingredients. May have to replace this one from my usual buffalo chicken dip. Buffalo chicken dip sounds GOOD though. I could eat it right now again too. Salsa chicken is one of my favorite meals, Dannii! I love how easy it is to whip up and how flavorful it is, too. I haven’t made it in the longest time, though! I love your pictures and how perfect your chicken looks! You’re definitely inspiring me to make this dish again! It has become a weekly staple in our house, just because of so easy it is. Wow could this get any easier? haha Now I want to make a big plate of healthy nachos covered in this chicken! delish! Hope you had a great weekend lady! This would be amazing on nachos! Yes it did! Thanks for persevering – the website should be fixed very soon. I wish I had room for this in my kitchen. I need something that does it all, instead of lots of different machines. You could always sell your other ones and just have this. It frees up lots of room that way. I love super simple, throw-it-in-a-pot dinners. These multicookers are so handy! They are my favourite kind of dinners. That guacamole looks amazing. Do you have the recipe for that? What a fantastic machine! My daughter is going to university next September and she is feeling a bit funny about sharing kitchen equipment, so without a lot of space of her own, this sounds perfect. This really will be perfect for her. She could even keep it in her room. I love how incredibly easy yet flavorful this is! Salsa really adds instant flavor to anything. My mum bought as this multicooker a couple of weeks ago and it has been a lifesaver. We have a 6 month old that hasn’t been very well recently, so we don’t have much time to cook. I didn’t know that fondue could be done in it though, that’s one of my favourite desserts. Sorry to hear about your little one. I can just imagine how useful the multicooker is to you at the moment. I love this simple recipes Dannii. Like you say, ideal for this time of year. I have lots more simple recipes planned for the new year too.